BAR HARBOR, MAINE – The MDI Biological Laboratory has announced that assistant professor Sandra Rieger, Ph.D., has identified two drugs that could potentially be used to reverse peripheral nerve damage, or peripheral neuropathy, resulting from chemotherapy treatment for ovarian, breast, lung, pancreas, and other cancers. The drugs also have potential applications for the treatment of peripheral nerve damage caused by diabetes, traumatic injuries and other conditions. The drugs are the subject of a provisional patent filed by the MDI Biological Laboratory earlier this month. Rieger, who is continuing to study the drugs, will work through the MDI Biological Laboratory’s for-profit spinoff company, Novo Biosciences, to move the drugs into patient trials. If the drugs prove to be effective at treating nerve damage, they will be licensed to a pharmaceutical company for additional studies, with the aim of achieving FDA approval. The MDI Biological Laboratory, located in Bar Harbor, Maine, is an independent, nonprofit biomedical research institution that develops solutions to complex human and environmental health problems through research, education and ventures that transform discoveries into cures. The institution is focused on increasing healthy lifespan and harnessing our natural ability to repair and regenerate tissues damaged by injury or disease. Rieger and other scientists working in the institution’s Kathryn W. Davis Center for Regenerative Medicine study tissue repair, regeneration, and aging in a diverse range of organisms that have robust mechanisms to repair and regenerate tissue. Damage to peripheral nerves can cause pain, numbing, tingling, temperature sensitivity, and muscle weakness. If the damage is severe, it can lead to serious problems such as falls, changes in heart rate, changes in blood pressure, difficulty breathing, paralysis, and even organ failure. The overall incidence of 2.4 percent translates to nearly 8 million victims in the United States alone, with the incidence increasing to 8 percent after age 55. Rieger has determined that, in the presence of paclitaxel, a widely used chemotherapeutic agent, peripheral neuropathy is caused by the increased expression of MMP-13 (matrix-metalloproteinase 13). MMP-13 is toxic to the nerves and increases the susceptibility of the skin on the hands and feet to injury from everyday stresses by degrading collagen, which Rieger described as the “glue” between the cells that helps the skin resist mechanical stress. The disruptions to the intricate interactions between the skin and nerves caused by the increase in MMP-13 activity are thought to contribute to paclitaxel-induced nerve damage. Her research has identified two drugs that prevent paclitaxel-induced neurotoxicity by reducing the activity of MMP-13, offering a new avenue for potential therapeutic interventions. When given with paclitaxel, these new drugs prevented the degeneration of axons (the long, slender protrusions of a nerve cell) and restored the touch response in zebrafish. 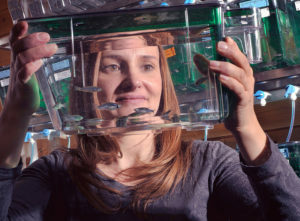 Rieger uses zebrafish as a model because they share 70 percent of their genes with humans; their brief lifespans also allow scientists to quickly gain valuable insight into fundamental scientific questions. Plans call for further testing in mammalian models such as mice and/or rats, as well as in human skin. Rieger is now collaborating with the Mayo Clinic in Rochester, Minn., on studies in human skin tissue. In addition to chemotherapy, neuropathies can be caused by diabetes, multiple sclerosis, obesity, chronic kidney disease, aging and many other conditions, creating a huge unmet need for effective treatment. While drugs are available that provide partial relief of the pain associated with peripheral neuropathy, none address the underlying causes. The global market for pain-relieving drugs provides an indication of the size of this market. This market, which was $4.8 billion in 2010, is expected to grow to $10 billion in 2018. This growth is attributed largely to the global rise in the incidence of obesity and diabetes.